Desert Foothills Air Conditioning & Heating Inc is proud to serve the Troon community! About Troon, AZ - Happy to be your hometown Heating & Air Conditioning Contractor! 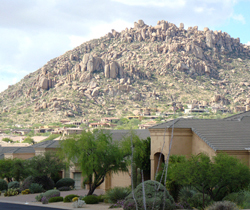 Troon Village is a residential golf community that is located in the northern portion of Scottsdale, Arizona. This community consists of 1,400 acres, and it offers residents a variety of amenities including a fitness center, swimming, and tennis. There are a variety of residential choices for this area, and many homes have spectacular views of the city lights, mountains, and golf course. This area is known for its subtropical desert climate with warm winters and extremely hot summers. Many of the attractions available at Troon Village are available through the Troon Country Club. In addition to the golf course that is offered, recreational opportunities are also available. The Troon Mountain Wine Society is also available, and there are a number of traditional social and holiday events available.